For our new cookbook, Fried and True (Clarkson Potter), Lee Brian Schrager and I tried hundreds of takes on fried chicken, eventually winnowing the contenders down to the 58 recipes that appear in the book (along with nearly 30 incredible side dishes). Not a bad gig. And while we love every single recipe, certain versions emerged—and endure—as favorites. These five reflect the astonishing variety of ingredients, techniques and cultural influences that go into making fried chicken, confirming once and for all that this national comfort food is as varied and multifaceted as America itself. Plus, scroll down for a coveted recipe from New Orleans. In Atlanta, chef Asha Gomez’s fried chicken and cardamom waffles fuse her southern Indian heritage with her adopted home, the American South. At her restaurant, Cardamom Hill, she marinates chicken thighs in buttermilk that’s been pureed with a garden’s worth of green herbs, plus chile, garlic and ginger. In the skillet the fragrant emerald green marinade bubbles up through the flour dredge, so that the frying process becomes as much a sensory experience as eating. The chicken is topped with a drizzle of warm, nutty coconut oil; maple syrup infused with Indian spices; and flash-fried curry leaves. The waffles—made with cooked rice, malt powder and cardamom—are the perfect complement. 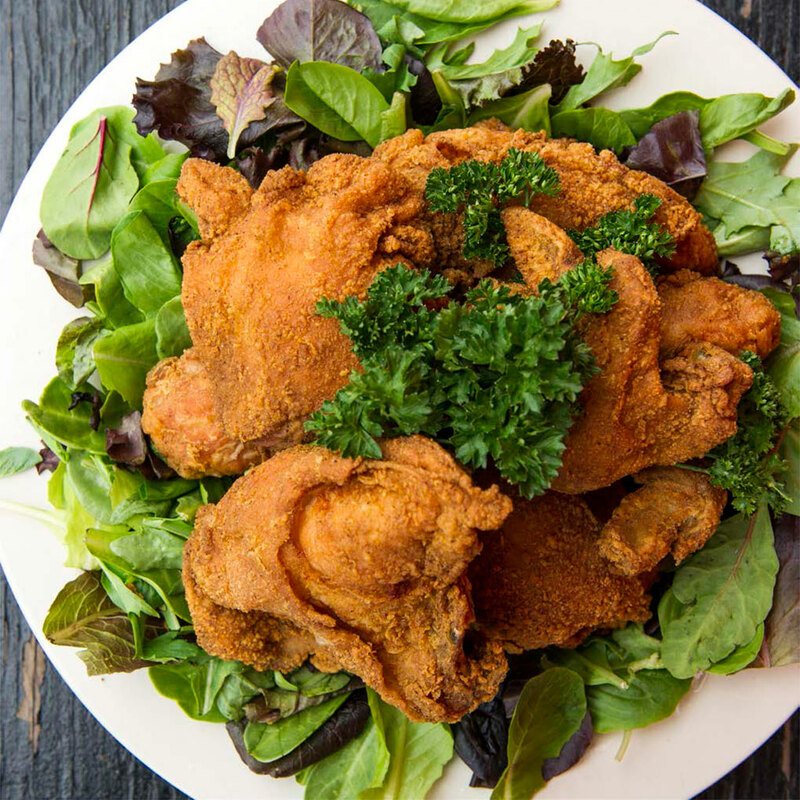 Seattle doesn’t naturally come to mind as a fried chicken stronghold, but we found a lot to love in the Pacific Northwest. Pretty much everyone we spoke to said we had to make the trip to Ma‘Ono Fried Chicken & Whisky, a charm-your-pants-off eatery run by husband-and-wife duo Mark Fuller and Marjorie Chang Fuller. A 2009 F&W Best New Chef, Fuller used his fine-dining chops to create one of our favorite plates of fried bird. Extensive brining—first in heavily salted water, then in buttermilk—and a double-fry make for some very juicy chicken indeed. The seasoning mix that Fuller sprinkles on top combines umami-rific kombu, dried shiitakes and soy sauce powder—a paean to the Johnny’s Seasoning mix that Fuller’s grandmother used in her Hawaiian recipes. We’ve also got to tip our hats to Lee’s good friend Art Smith, whose chicken keeps us up nights, dreaming of its deeply burnished exterior and tender, juicy meat. The dredge for Art’s chicken, made with self-rising flour, is punctuated with a pantry’s worth of dried spices that create a mouthwatering crust reminiscent of herbed crackers. Skillet frying at a super-low temperature encourages extra crunch—never a bad thing in our book. No best-of list of ours would be complete without Michael Solomonov’s genius recipe, one that he graciously adapted for us from the original he serves at Philadelphia’s Federal Donuts. Solomonov air-chills his chicken uncovered overnight, a process that concentrates flavor and wicks moisture from the skin and banishes even a hint of flabbiness during frying. The crêpe-like rice batter adheres to the chicken like a second skin during frying. Solomonov’s sauce, made with kecap manis—a sweet Indonesian soy sauce—is spicy, garlicky and irresistible. We were skeptical about a recipe as simple as Kermit Ruffins’s “hard-fried” chicken, but one bite had us converted. Kermit—a celebrated New Orleans musician who played himself on the late, great HBO series Treme—served fried chicken at his recently closed restaurant. This recipe’s signature, its shattering crust, is achieved with the help of baking powder. The dredge’s hallmark salty, savory flavor gets an assist from Morton’s Seasonall, an easy-to-find, MSG-packed blend that gets the job done. The final fried chicken hack? A dip in egg instead of the more expected buttermilk, which lends airy texture to the finished product. Make the dredge: In a large bowl, combine the flour, seasoning, baking powder, and pepper. Fry the chicken: Prepare a deep-fryer or fill a large (at least 6-quart) pot halfway with oil and heat to 355°F to 360°F. Dredge the chicken in the flour mixture, shake off the excess, and fry until the chicken is dark brown and the crust is brittle, 16 to 18 minutes. Drain on paper towels and season with salt to taste.